Art and everyday activities are intertwined in inseparable ways throughout a life. Drawing and painting are languages that connect Ides to life in a poetic way. They form her spiritual backbone, and her ascetic lifestyle flows in function with art and the involvements it demands. Ides Kihlen was born on July 10 of 1917, in the province of Santa Fe. Her childhood was spent on the banks of the Paraná River in the provinces of Corrientes and Chaco. Painting was a constant companion in Ides’ life. Music was the other passion that accompanied her since youth. 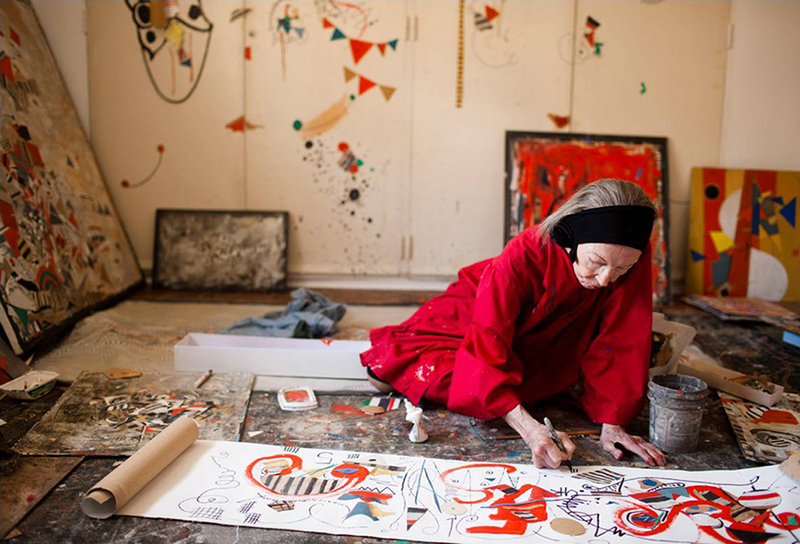 After moving to Buenos Aires, she enrolled at the National School of Decorative Arts at an early age, giving rein to a vocation that she still actively pursues at eighty-four. Pío Collivadino, director of the School of Decorative Arts, after accepting her as a student, discovered her enthusiasm and her vocation. For more than a decade, She was Vicente Puig’s favourite student. Then, she continued her formation at other artists’ studios: at Emilio Pettoruti’s, with André Lhote in Paris. She also worked under the aegis of Battle Planas, who was highly influential in her work. She studied Art History and visited museums around the world. Nothing, however, could interrupt her own deliberate rhythm. Her work developed independently of the artistic trends in Buenos Aires at the time. The process was an eloquent expression of her personality. Ides Kihlen decided, before anything else, to be true to her own internal pace. For long stretches of time, she was more interested in the production of art than in obtaining results. This attitude generated two consequences: the first was that she did not consider herself to be a professional artist. She never attempted to forge a career as an artist. She simply was an artist, and that was enough for her. The second result was a consequence of the first. She destroyed much of her work and, as can be expected, never bothered to title or date her paintings. The witnesses to this process were her professors, her companions in the different studios, artist Adolfo Nigro, to whom she showed her early abstract work in the 1980s, and, of course, her two daughters and her granddaughter. 2015 Art Palm Beach, January, USA. 2013 Paseo de las Artes (Palacio Duhau) November, Buenos Aires. Argentina. 2012, Art Gallery Sarrabayrouse, "Marcela Toys" Buenos Aires. Argentina. 2011, Coppa Oliver Art, 80 years of painting, Buenos Aires. Argentina. 2002, National Museum of Decorative Arts, November. Retrospective and presentation of his book Ides Kihlen, NY Deutsche Bank Argentina. There are gifted human beings that differ from the ordinary mortals. Ides Kihlen is one of them.